Abby Normal, the fated “character” in the Mel Brooks film Young Frankenstein is brought to you in this kinetic type animation. Prompted to create a typographic animation of a quote from a film, I chose to illustrate and animate the famous Abby Normal scene in a funny and mechanical way. I was inspired by David Plunkert’s wonderful and eccentric illustrations, collages, and the way he activates the human body. I wanted to create something that fit the feel of the movie and also spoke to the scene itself. 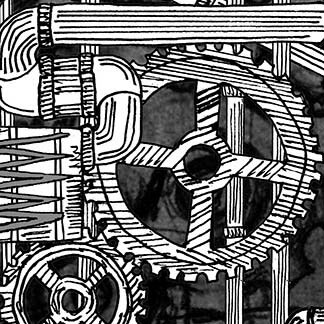 I illustrated the interworking of a head using industrial parts all “Frankensteined“ together through illustration. They work to activate the space with a flow of movement and words, bringing the hilarious scene to life in a new way.